FRISCO, Texas (March 22, 2018) — US Youth Soccer is proud to announce the US Youth Soccer National League 14U, 15U, 16U, 17U and 18U Boys and Girls teams that have qualified to compete in the 2018 US Youth Soccer National Championships, which are being held July 23-29 in Frisco, Texas. Just five teams clinched their position as division champions prior to the final weekends of play in March in Las Vegas, where the remaining division champions were crowned. Of the 27 National League titles captured during play in Las Vegas, 13 were decided on the respective final day of the boys' and girls’ seasons — showcasing the league’s depth of talent. 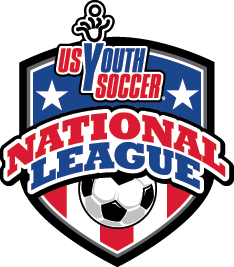 By way of their success in the 2017-18 US Youth Soccer National League, the division winners in each age group, along with second-place finishers in the 14U and 15U age groups, have earned a direct path to the National Championships. Annually, the final leg of the nation's most elite and prestigious competition provides the opportunity for additional exposure to collegiate and national staff scouts and the chance to capture the National Championship title in their respective age group. CDA Premier 04 (KY) hung on for a 3-2 win against Michigan Jaguars 04 Green (MI) on the first day of the season, and the Kentucky side never looked back — winning all seven of its games to claim the 14U Blue Division title. Meanwhile, the Jaguars earned 16 points from their final six games to finish in second and punch a ticket to Nationals. In the 14U Red Division, Nationals Union 04 Black (MI) won four games by a one-goal margin en route to an undefeated season and first-place finish. It tied Arlington SA (VA) on the season’s final day, as the Virginia side settled for second place in the Red Division. By becoming just the third girls team to concede zero goals in a season, PDA Shore Freedom (NJ) held on to finish on top of the 15U Blue Division. GPS Oregon FC Bayern 03 (OR) earned a second-place finish in the group by picking up a key win on the season’s final day. An offensive outburst in Las Vegas helped local side LVPSA 03 Red (NV) finish first in the 15U Red Division, while the team it caught — CSA Impact United 03 Black (OH-N) — will advance to Nationals as the group’s runner-up. With all but one game decided by multiple goals, La Roca-FD 02 (UT) asserted itself as the top team in the 16U Black Division while going 7-0-0. By conceding just one goal all season, Fullerton Rangers 02 White (CA-S) finished with an undefeated record and the 16U Blue Division title. By outscoring opponents, 8-to-1, in Las Vegas, SJEB Rush 02 Academy Blue (NJ) secured a first-place finish in the 16U Red Division, while Legends FC 02 Academy (CA-S) used a dramatic late goal in its final match of the season to finish on top of the 16U White Division. Premier Navy 2001 (MD) picked up seven points in Las Vegas to hold off the rest of the teams and win the 17U Black Division. In the 17U Blue Division, FCKC Academy Blues Elite (MO) pitched a shutout during games at IMG Academy to win the group, while BC United 01 (NY-W) earned an important point in its final game in Florida to clinch the 17U Red Division title. Meanwhile, TFA Elite 01 (OH-S) earned clean sheets in five of its seven games to earn the top spot in the 17U White Division. By conceding just one goal on its way to a 7-0-0 record, Campton United 1 (IL) won the 18U Black Division. A 2-1 win over Legends FC 00 South (CA-S) provided Princeton SA (NJ) with the tiebreaker it needed to claim the 18U Blue Division title. Despite dropping points in two of its first three games, Scottsdale Blackhawks Taylor (AZ) fought back to earn the 18U Red Division crown on the season’s final day. And HBC Impact 00 (NY-E) rode a hot start in North Carolina to the 18U White Division title, as it went 5-1-1. With six wins in seven games, Nationals Union 04 Black (MI) finished at the top of the 14U Blue Division. The only team that beat Nationals, USA/MP 04 Premier (SC), used that victory to finish second in the group and book its place at the National Championships. In the 14U Red Division, NM Rush 04 (NM) used an undefeated season to become the first team from its state to win a National League division title. PPA KSA 04 Pro-Profile (GA) finished just behind Rush and will head to Frisco as the Red Division runner-up. Behind an offense that averaged more than five goals per game, LVSA 03 Silver (NV) won all six games to take first place in the 15U Blue Division. Meanwhile, a vital win for USA Mount Pleasant 03 Premier (SC) in its last game allowed the South Carolina side to finish second. OK Energy FC Central 03 (OK) picked up four shutouts in six wins en route to taking the 15U Red Division title, and Beadling (PA-W) picked up points in every game while finishing second in the group — punching its ticket to Frisco, Texas. A strong start to its season in North Carolina allowed Washington Premier 2002 Black (WA) to finish 4-1-1 and claim the 16U Black Division title. A late goal in its final victory allowed St. Louis Scott Gallagher SC Elite (MO) to secure a vital tiebreaker advantage over hard-charging Boca OC 02 White (CA-S) to finish on top of the 16U Blue Division. Meanwhile, Midwest United FC 02 Royal (MI) won a winner-take-all matchup in its final game to claim the 16U Red Division title. And Solar Chelsea Red 02 Stricker (TX-N) is heading back to Nationals after winning the 16U White Division thanks to a perfect record in Orlando. Defending National Champion Tampa Bay United (FL) came back in Orlando to finish in the 17U Black Division and earn a return trip to Nationals. In the 17U Blue Division, SLSG Elite 01 (MO) won its first five games, which was enough to finish in first place. McLean Green 01 (VA) used a strong performance in Orlando to pick up enough points to win the 17U Red Division, and Oklahoma Energy FC 01 Central (OK) secured first place in the 17U White Division during play in Orlando. Washington Premier 2000 Black (WA) capped off an undefeated season with three wins in Las Vegas to capture the 18U Black Division title, while West Coast FC Armour 2000 (CA-S) won all six of its games to finish atop the 18U Blue Division. Elsewhere, Baltimore Celtic SC 00 (MD) finished up its season in Orlando with five wins and a draw, which was enough to seal the 18U Red Division title at that time. On the other hand, it came down to the last day in the 18U White Division, where Sparta 00 JK (UT) won to take first place in the group. The 40 Boys and Girls teams that qualified for the National Championships through the National League will be joined by 56 US Youth Soccer Regional Champions to complete the field of 96 teams this summer in Frisco, Texas. The National League’s alumni have gone on to prove themselves at the collegiate and professional levels, with former players competing in NCAA Division I, II and III, Major League Soccer, National Women’s Soccer League, the UEFA Champions League, the Olympics and the FIFA Women’s World Cup. The US Youth Soccer National Championships cap a yearlong series of competitions that comprise the US Youth Soccer National Championship Series. Boys and girls teams in multiple age groups earn their way by competing against the top teams in their state and region. US Youth Soccer State Champions and selected wildcard teams are eligible to compete in one of four US Youth Soccer Regional Championships. The champions in the 13U through 19U age groups from each regional event will converge in the finals with the National League teams. Click here for the dates and locations of the Regional Championships. For more information on the US Youth Soccer National Championships, visit http://championships.usyouthsoccer.org, the online home for the US Youth Soccer National Championship Series, providing the latest in news, information and more.